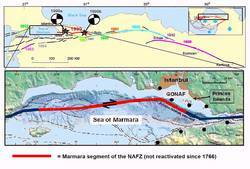 The GONAF project involves the installation of a high-resolution borehole seismic observatory at the North Anatolian Fault Zone (NAFZ) consisting of several shallow (up to 500m deep) vertical boreholes in onshore locations around the eastern Sea of Marmara/NW Turkey. The principal scientific objective is to study physical processes acting before, during and after the expected M>7 earthquake along the Princes Islands segment of the NAFZ by monitoring microseismic activity at significantly reduced magnitude detection threshold and improved hypocentral resolution. It is also intended to study wave propagation characteristics of a large earthquake using downhole seismic recordings at different spots along the potential rupture.